GREAT LO!!! Something to be treasured. Love the tree and your journaling. Love the sentiment in your journaling. As a military family we often found ourselves in a different town on many Christmasses and far from what we called home and family. I like your LO. Your tree is lovely. Virginia is full of many traditions of Christmas, so select a new one and make it yours. Merry Christmas! are the stamps tops or ornaments? Was that one stamp or a stampin wheel? I love how you did it overlapping the two papers, what color ink is it, I love the subtlety! You've grabbed the interest of a rubber stamper lol. oops found another question, the gifts are stamped in gold ink? Or are they gold embossed? If it's just ink what is the brand it is much shinier than my gold ink pad comes out. Those ornaments are just cheap 1.00 stamps from Joanns the clear ones, they are 3 ornaments I just stamped over and over again then chalked a bit in brown over gold ink. The gold ink was 1.00 in the bin with the cheap stamps. I bought white and it sucked, it did not even stick. I bougth silver and it was so so, but the gold was really nice. The packages are stamped in the cheap 1.00 gold ink. I don't have alot of stuff yet. Just real cheap basic stuff. So I just use what I have. OH the brand is VIBRANCE INK. Well you have the vintage look down just fine As far as paints go. Go to wal-mart, Michales and buy the cheapest acrylic paint you can find. Like 44 cents for a 2 oz bottle. (don't know if Jo'anns carries the cheapy one's or not) You can use acrylic paint with your stamps just apply it with a piece of foam sponge or one of those white make up sponges to your stamp. They even have metallic and glittery acrylic paints they are a bit more expensive but still under a dollar a bottle. Lots cheaper than getting inks in that many colors. Okay last question, is the off white paper in back a printed paper or did you stamp it? I did not know you could use paint with stamps, THANKS! The paper. It was a paper bag I got from WalMart no stamping just chalk and crumpling. then I turned it over to the brown or off white side to finish the tags. 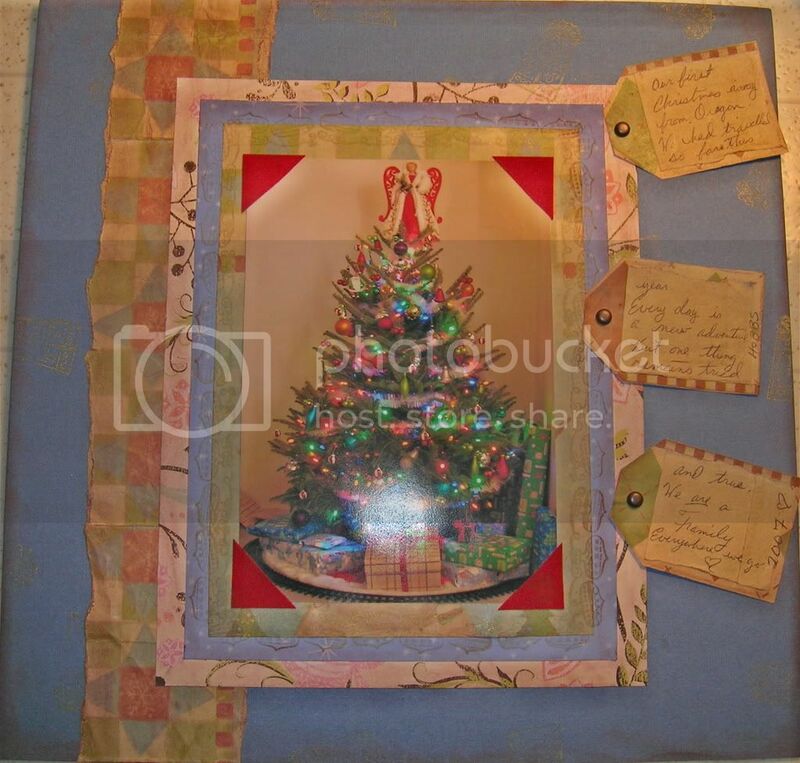 Love this LO with all of your paper choices and certainly highlights your beautiful tree.